is a castle near Leobendorf in Lower Austria, Austria. Burg Kreuzenstein is 265 metres (869 ft) above sea level. It was constructed on the remains of an early medieval castle that had fallen into disrepair and was then demolished during the Thirty Years’ War. Intended to be a family vault for the Wilczek family, it was rebuilt in the 19th century by Count Nepomuk Wilczek with money from the family’s large Silesian coal mines. Kreuzenstein is interesting in that it was constructed out of sections of medieval structures purchased by the family from all over Europe to form an authentic-looking castle. Thus, the castle can be considered both a ‘neo-‘ and ‘original’ medieval structure. The castle is sometimes used as a location for films. This castle is sometimes confused with the medieval castle Burg Liechtenstein, where the movie The Three Musketeers was filmed in 1993. The castle is located just north of Vienna and the Danube on a rising above Rohrwald, directly above Leobendorf and between the towns of Korneuburg and Stockerau. The elevation is 266 m (AA), the height above the Danube about 100 metres (330 ft). Close to Burg Kreuzenstein is a water gap in the Danube called Wiener Pforte (“Viennese Portal”), so that it allows a wide view of the current course of the river and the Korneuburger Becken (“Korneuburger sedimentary basin”) upstream . 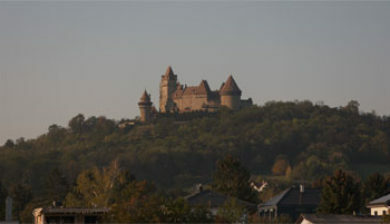 Approximately opposite to Burg Kreuzenstein, on the south bank of the Danube, lies Burg Greifenstein castle.